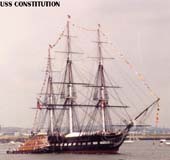 USS Constitution, the oldest warship of the US Navy and the oldest commissioned warship afloat in the world (HMS Victory is older, but is preserved in drydock), underwent a massive restoration from 1992 to 1996. The final phase of this restoration saw her fitted with sails and sailed under her own power for the first time in 116 years, on July 21, 1997. This photo feature presents various views from earlier in the restoration process. 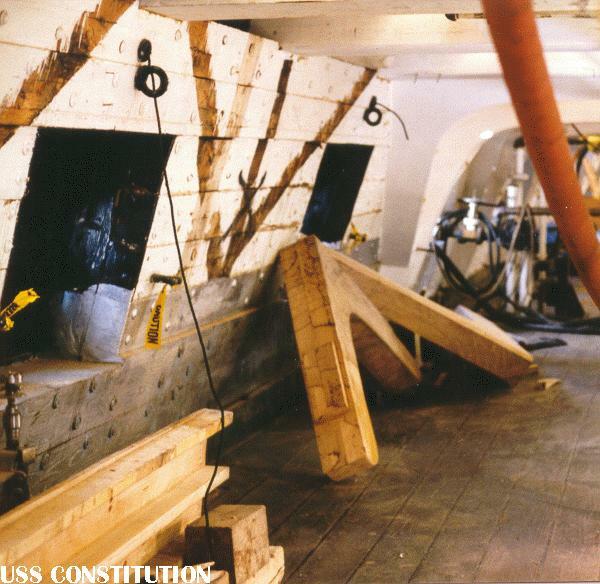 These pictures were taken from the bottom of Constitution's drydock, and from aboard the ship during the restoration work. Also included are several photos of her July 4, 1996 turn-around cruise, her first trip away from the dock since 1992. 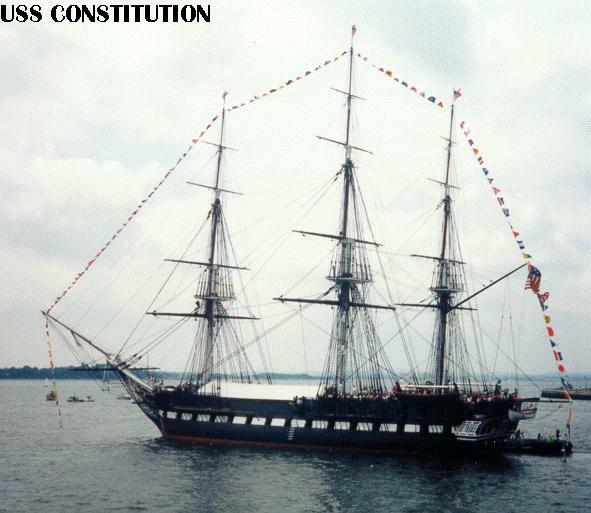 Following the Sail Boston '92 "tall ships" event Constitution was drydocked for a comprehensive restoration. This restoration returned her to her condition at the time of the War of 1812, when she gained her fame. The previous restorations had not been totally faithful to her original design, for a variety of reasons. 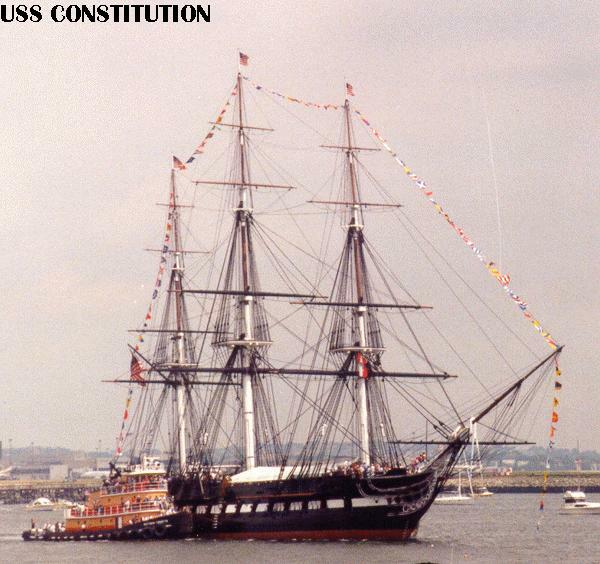 This restoration used plans of Constitution's sistership President, the only known plans for this class of vessels. The initial work consisted of stripping the ship: all rigging, guns, copper, caulking, ballast, and non-structural material was removed. In order to keep her hull from drying out while she was drydocked, about 4 inches of water was kept in the dock at all times, and her hull below the waterline was draped with huge sheets of canvas to keep out the sun and keep in the moisture. This effort was quite effective--her keel was moist to the touch two years after she was docked. All deteriorated wood was replaced with new material. Much of the new live oak was 'hurricane kill' from hurricane Hugo; teams were sent into the field after that storm, templates in hand. Pieces that fit the templates were shipped to Boston, where they were stored (some under water in the drydock). Extra live oak has been laid in for future requirements. A couple feet of hog was taken out of her keel, using specialized variable-thickness keel blocks. All internal braces, knees, etc. 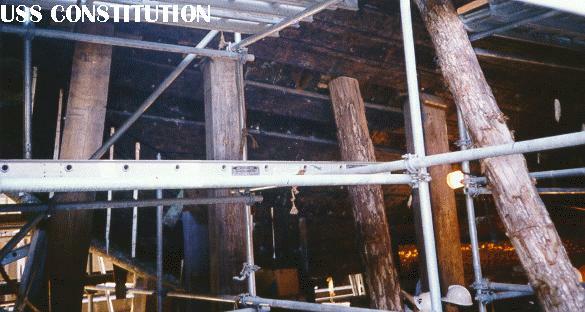 were replaced, including many knees and other structural members left out or improperly replaced during previous rebuilds. This will do a lot to prevent future hogging. All the metal rods/bolts/etc. in the hull have been inspected with sonar, and the few defective rods have been replaced. Most of these 200 year old rods, some up to 6 feet long, are in excellent shape. Most of the metal fittings are original. She received all new spars, many made of glue-laminated boards instead of the 4 piece "built" spars used previously. This will prevent cracking and checking of the spars. She also received get new rigging, new caulking, new copper, etc. All bulkheads, fancy work, etc. were be replaced or repaired as needed. New lighting and fire protection systems were installed; they will be less ugly than the previous systems. 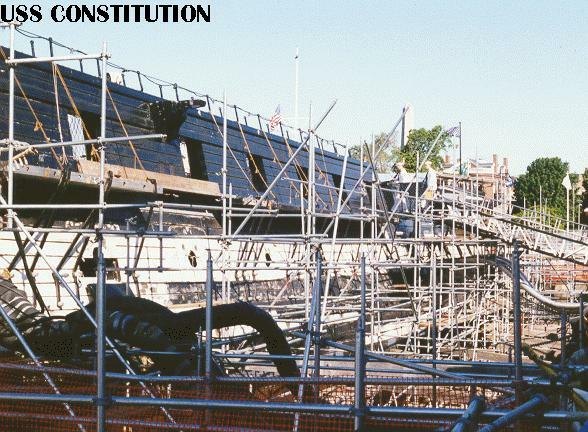 Constitution was floated out of the dock in late 1995; rigging and fitting out work went on well into 1996. Sailmaking started in 1996 and stretched well into 1997, with the final sails going aboard just prior to her historic sail. I was fortunate enough to gain access to the drydock during the restoration process, and to gain access to sections of the ship that are normally closed to the public. 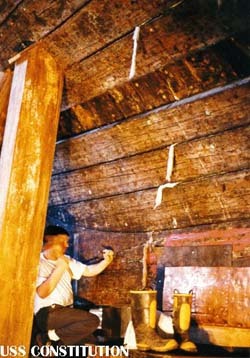 Port side of the hull, forward, showing the keel and stem. This view is taken from the port side, slightly forward of where the stem joins the keel. 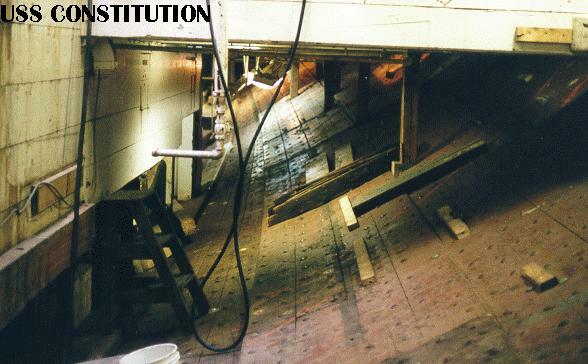 It shows the majority of Constitution's planking in place, with several planks removed for replacement, revealing the frames behind them. The quantity of blocking, shoring and staging in the drydock is quite apparent, as is the resulting difficulty in photography. The bright, gleaming metal at the lower right corner of the photo is new copper on the keel. Another view of Constitution's port side, forward. This view was taken just aft of the previous one. It shows her hull structure and details more clearly. 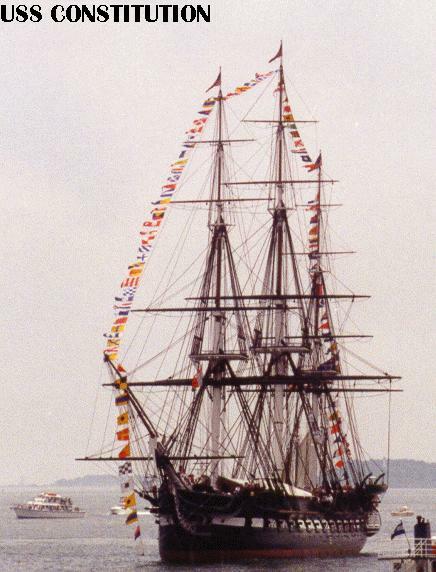 Close-up view of Constitution's hull. 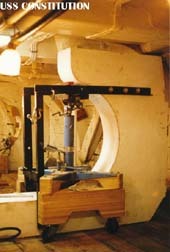 This view, showing a caulker at work, was taken slightly astern of the previous two, and shows the actual joint between the keel and stem. 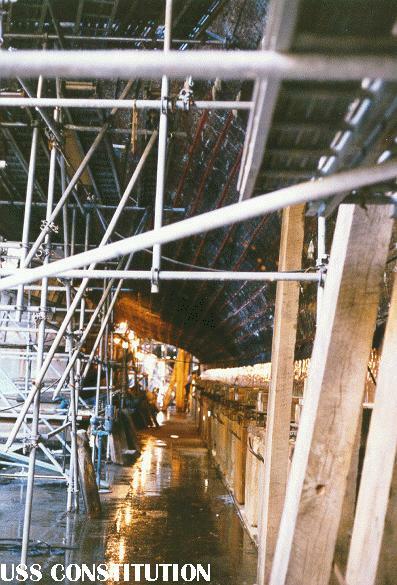 The missing plank near the top of the image shows how truly massive Constitution's hull structure is -- note how the frames are literally touching each other, giving the hull great strength. The rubber boots attest to the fact that the drydock was normally kept awash with four inches of water to keep the ship from drying out. Most of the wood in this view is original, 1700's material. View along Constitution's keel, looking from stern to bow along the port side. THe new copper on the keel gleams, and puddles in the dock reflect the light, The dock had been drained to make this visit posssible, else this view would have included a shallow lake running the length of the dock. 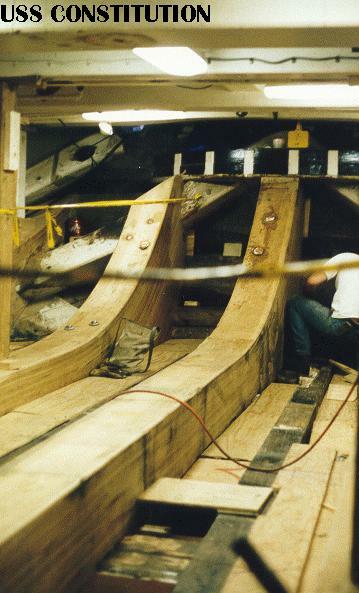 Massive new timbers installed in Constitution's stern. This view looks aft, from port to starboard. The near-vertical surface at the rear is the transom. 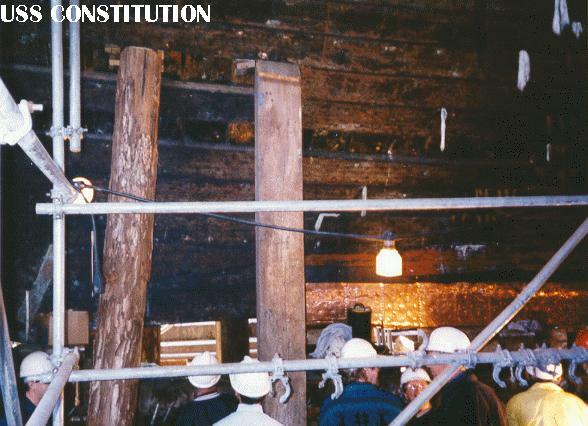 These timbers, and a third out of view to the right, will serve to support and strengthen Constitution' stern. The stern is normally the weakest area of a vessel, and tends to hog (sag) quickly. These timbers tie the stern into the rest of the hull structure, hopefully delaying or preventing hogging problems in the future. New knees installed, and knees waiting to be installed, along the starboard side. The newly installed knee at right, and the knee resting on the deck at center, compared to the outlines of the old knees on the hull, show how much larger the new knees are. Previous restorations hadn't been concerned with hull strength, on the premise that the hull would not be strained while the ship sat dockside as a museum. Therefore smaller knees had been installed, and some had been left out entirely. Unfortunately, hogging takes place even when the ship is no longer sailing, so the larger structural members are needed. Installation of a very large knee aboard Constitution. Compare to the previous, smaller knees beyond this one to see an excellent illustration of the strengthening taking place during this restoration. Constitution's orlop deck. No changes are evident in this view, although all the modern crew quarters formerly housed in part of the orlop had been ripped out. Large diagonal timbers know as "diagonal riders" were later installed long the hull here, greatly strengthing the ship. 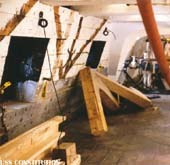 These timbers had been left out during previous overhauls, and might have been eliminated while the ship was still in service as a combat or training vessel. Constitution in drydock. The massive amount of scaffolding around the hull is quite evident in this view, looking forward along the starboard side. 1996 was Constitution's first turn-around cruise since 1992. 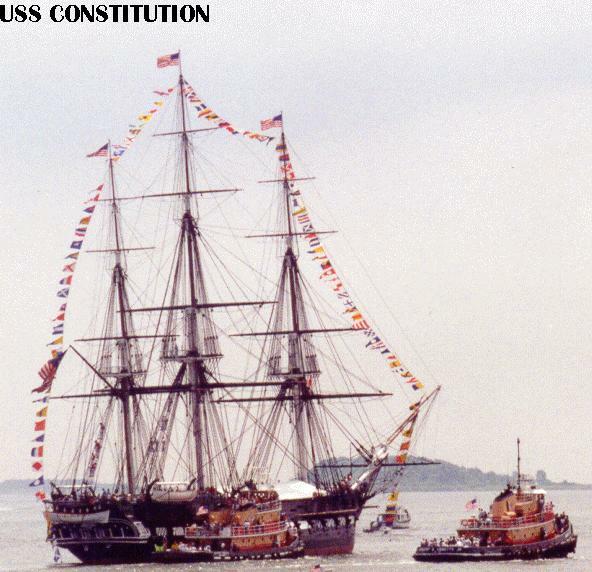 In addition to the normal festivities, Constitution was "escorted" by a fleet of museum-warships and "tall ships". Museum ships included the heavy cruiser Salem (CA 139) and the destroyer Cassin Young (DD 793). 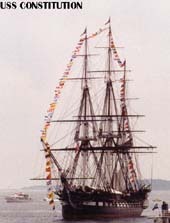 Tall ships included HMS Bounty, Gazella of Philadelphia, Spirt of Massachusetts and Ernestina. 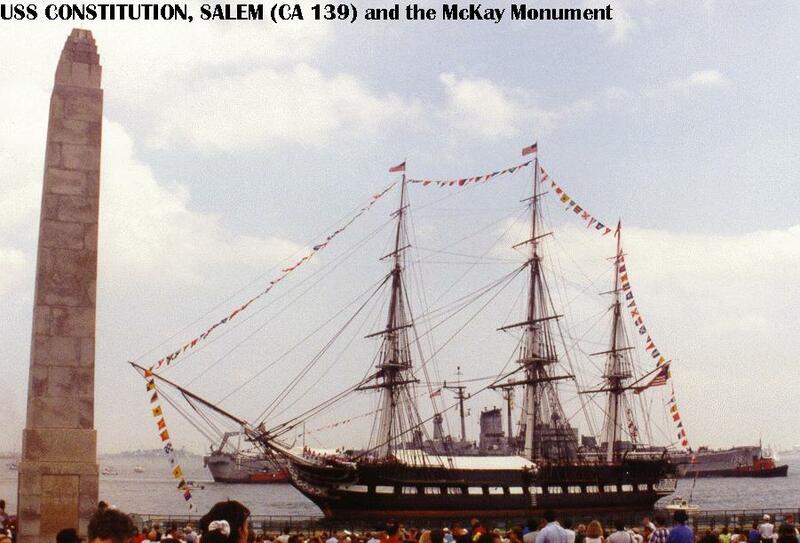 Some of these photos were taken from Castle Island (Fort Independence), and others from aboard Salem. Constitution outbound from the harbor, approaching Castle Island, under tow as always. View is from Castle Island. 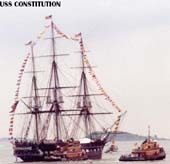 Constitution passing Salem. View is from Salem. Constitution outbound, having passed both Castle Island and Salem. View is from Castle Island. Constitution inbound, preparing to fire her traditional 21-gun salute. View is from Castle Island. 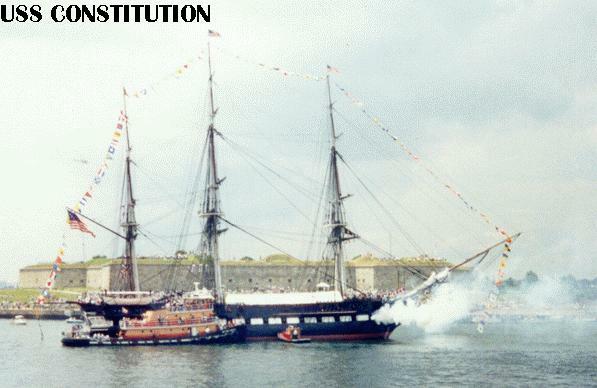 Constitution firing her starboard-side cannon during the 21-gun salute. View is from Salem; Castle Island and Fort Independence are beyond Constitution. Constitution during the 21-gun salute, with Salem beyond. The monument at left honors Donald McKay, an East Boston shipbuilder best known for his record-breaking clipper ships.